January 14, 2012 will go down as my greatest wrestling memory. I have no doubt about that. Not only is it the night that I got to call an incredible match between PAC and El Generico, and meet Colt Cabana, but I also made my wrestling debut that night. At nearly 39 years of age, I never thought this day would happen. The last year has been incredible for me in terms of wrestling. I got the opportunity to "manage" Velvet Sky at a TNA house show event, join the commentary team of All American Pro Wrestling, and wrestle in a match in front of hundreds of screaming fans. For those who missed the back story, you can get caught up on the angle here. On the day of the show, I was extremely nervous. I had literally only been in the ring one time before to run the ropes, take and give some chops, and get sent into the turnbuckles. It wasn't until the afternoon of AAPW Main Event that I actually got body slammed, clothes lined, and "punched" for the first time. We worked out the match and how it was going to go and I began to feel a lot better about the whole thing. We were the semi main event, so I had done the commentary for the first half of the show. When I went back at intermission to get into my ring gear I stayed cool, calm, and collected. We discussed the match twice more to make sure I'd remember everything. As I've mentioned, I'm not a wrestler, so we weren't looking to put on a show like anyone else on the card had done. My opponent Mike Masters went out first. I think all 405 people in attendance were booing him. He had incredible heat. As I watched on a monitor near the Gorilla Position it hit me. "I'm about to go out there and WRESTLE, or at least try to." That turned into almost a feeling of light headedness. Then I started worrying I'd forget everything we planned. But Mike had told me if I did, not to worry. I was instructed to crawl around the ring, and he'd beat me up and remind me along the way. When I came out, the crowd popped. I walked over to AAPW Executive producer Chris Hagstrom, who is also on the announce team, and begged him to call off the match. Since he wouldn't I reluctantly made my way into the ring. Once we actually made contact and Masters slammed me, I felt completely disoriented. I wasn't sure where I was inside the ring. I knew that I had to look toward the hard camera for the upcoming DVD, but for a moment, I wasn't sure where it was. I also had experienced a severe case of cotton mouth. I can't remember everything that happened of course, but I know he choked me on the ropes and crashed across my back. He also took me to all four corners and did chops across my chest. Well, when we got to the fourth corner, I moved out of the way and did four or five quick chops to him, thinking I had the momentum only to have my eyes raked and beat back down to the mat. The finish saw me getting chocked on the ropes again and Masters going for the jump, but I moved, causing him to rack himself. I clothes lined him, body slammed him, and went for the cover, only to have him kick out. Then he hit me with a low blow, clotheslined me, and did a Juvi driver, but broke the count up at two himself. He said he wasn't finished with me and went outside the ring for a chair. He threatened to hit me with it, but instead sat on it and taunted me. 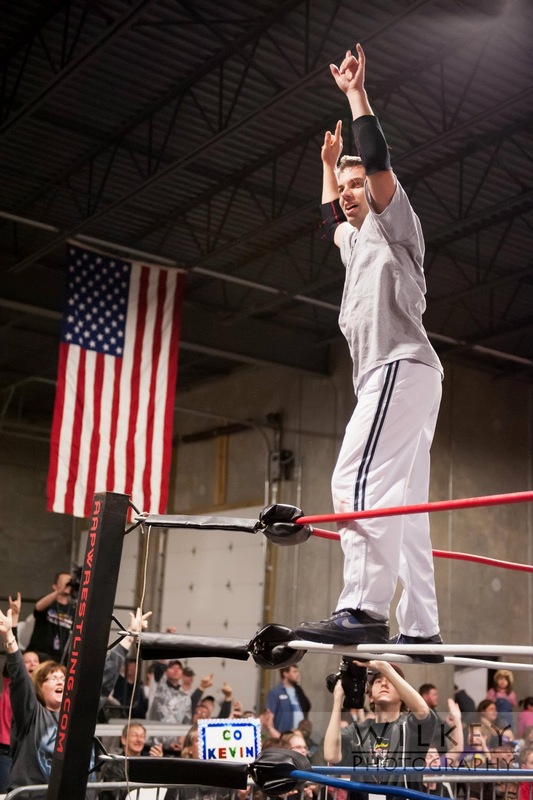 This prompted Chris to jump on the apron and plead with the ref to end the match. With the ref's back turned, Jay Spade, who had lost a match to Masters to cause the challenge to happen, whacked and unsuspecting Masters in the head with the chair. I hooked his leg and got the win. Immediately I jumped up and celebrated. 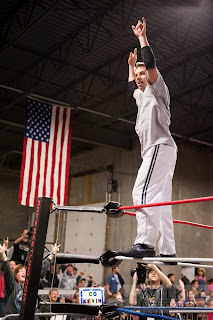 I climbed the ropes and soaked in the cheers of the crowd. I hugged Chris and Jay and the three of us stood in the ring with our hands held high. I noticed the ref had a troubled look on his face, but I thought he was selling the moment, so I left the ring and ran around it, slapping hands with my family and the fans in attendance. As I looked down I saw blood on my hand. I thought it was a scab that got knocked open or something, but moments after I got backstage I turned around and Mike came through the curtains with a crimson mask. The chair shot busted his head open pretty bad. A lot of people asked me if that was real blood and if it was supposed to really happen. Yes, it's real blood. No, it wasn't supposed to happen. It was an unfortunate accident. It sometimes happens in the world of wrestling. Other wrestlers and someone with medical training in the crowd tended to his wound. An ambulance arrived shortly there after. Luckily, Mike only needed five staples in his head. There was no concussion and he even came back to the arena as we were cleaning up to let us know he was okay. So for those who think wrestling is "fake", again I tell you it may be predetermined, but calling it fake is not fair. 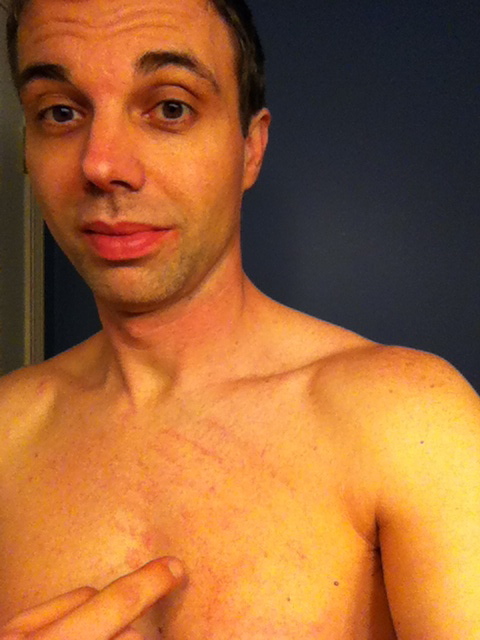 Look at the blood stains on my pants and the red marks on my chest hours after the match. My body is sore and achy, like after an intense workout. Taking the mishap out of the equation, it was truly an amazing night. If I forget to thank you here, I apologize. But I can't thank Mike Masters enough. Also Heath Hatton and Edmund "Livewire" McGuire for training me. Jay Spade for his assistance with the match. Chris Hagstrom for giving me a shot with AAPW in the first place. Adam Testa for his friendship and support leading up to this, even though he claimed to be #TeamMasters. Sean Mocaby and Greg Anthony for their support and asking me to be involved in AAPW. Really all the guys with AAPW who shared kind words with me before and after my match. My friends and coworkers, and the folks who drove hours to see the show. The fans who I don't know who made an effort to be there. And of course my wife and kids for letting me live out a dream. Perhaps this is a my midlife crisis. I'm having so much fun, I just wish this opportunity would have come sooner in my life. The Main Event DVD will soon be released. Be sure to pick up a copy if you missed the show. Colt Cabana, PAC, El Generico, and our surprise guest Matt Cross M-Dogg 20 were all awesome. And of course all the stars of AAPW tore the roof off. All the matches were intense and exciting. It was a pleasure being a part of the biggest show in the history of this fine company. To learn more about AAPW, head to the website. Great event! I remember watching wrestling on telelvision when I was a kid, but this was the first time attending a live event...what a great time my boys and I had watching (and even cheering)! Sorry to hear of Mike's mishap, but what an exciting time! Thanks Rhino. Mike is doing much better. Just talked to him again (through text). I'm glad you and the boys had fun. Hope to see you out again. On a scale from 1 to 10, how much did those chops hurt? They hurt me a little just by watching them from ringside. I'm so happy for you, Kevin. It's great to see hard work pay off and it was probably a huge relief that everything went almost exactly according to plan. So true about the "wrestling is fake" comments. Far too much ignorance exists. From that clip, I can see now why AAPW hired your announcing services. You've got a great voice for the microphone and a natural passion for the business. That's something even the mainstream promoters struggle to find these days. Thanks for being there Ian. Wished I'd have known, I would have said hello. Hopefully you can make it to a future show. Our next one is March 17th. The chops stung pretty good. He told me he was not going to go easy on them, so I was mentally prepared. On a scale of 1 to 10, I'd say a 6.5 or 7. He could have made it much worse. Thanks again for coming out and reading the blog! They hurt me a little just by watching them from ringside. Oh actually, I wasn't there. But that sentence was probably what confused you. I should have phrased that better. My bad. I meant to say whenever I attend live wrestling shows in general, those chops always look so painful. That's why I was wondering. But I have been following the blog and all your adventures over the past year and it's awesome. This seemed like such a cool experience that I wanted to offer my congratulations. Stories like these make fellow wrestling fans proud. I might buy the DVD just to see for myself how it all played out. Gotcha. Well, thanks so much for reading! Dude, you were f'n awesome that night, as was Mike. Great build, great in ring story, and great crowd. Be proud of what you and AAPW accomplished. Thanks so much. I haven't watched the match back yet. It was very awesome. I'm proud for it being my first outing. Mike was a true pro. can't say enough about it. I've said this before and will continue to say it... with all due respect to every wrestler on that card, Hunsperger V. Masters is what drew that show and put the majority of the butts in the seats. Thanks Kevin.